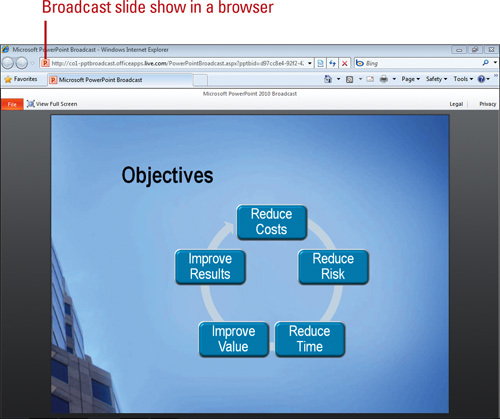 If you want to share your presentation with others at different locations, the Broadcast Slide Show command (New!) allows you to display a slide show over the Internet. Before you start the broadcast, you send a URL link to your remote audience via an e-mail or copied link that they can use to access and watch your slide show in their browser, which supports Internet Explorer, Firefox, and Safari for Mac. 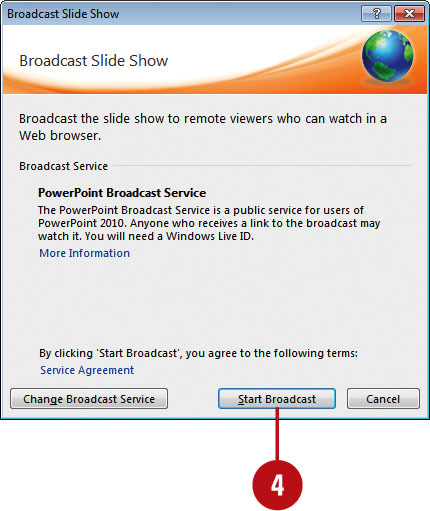 To use the Broadcast Slide Show command, you need to use the PowerPoint Broadcast Service provided by Microsoft at no charge along with a Windows Live ID or use a broadcast service provided by your organization on a server that has the Microsoft Office Web Apps installed. In the browser delivery of your slide show, some features are changed, including transitions shown as fades, no audio or video, no ink annotations, can’t follow a hyperlink, and screensavers and e-mail popup can disrupt the view. 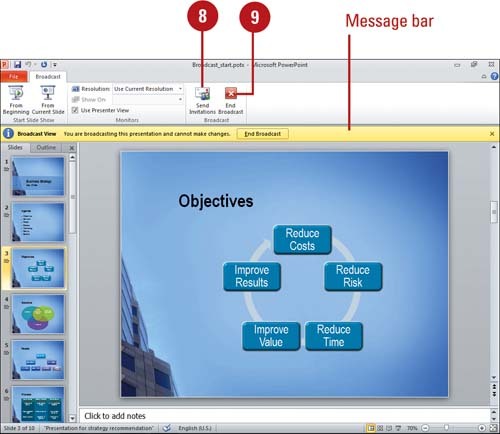 Open the presentation you want to broadcast. Click the Slide Show tab. Click the Broadcast Slide Show button. Enter your Windows Live ID e-mail address and password, and then click OK.
Click the Copy Link or Send in Email link to share the link to access the broadcast. 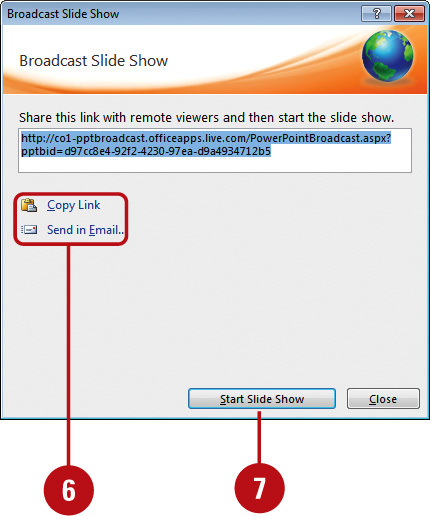 Your audience can open the link in their browser to follow along with your slide show as you display it in PowerPoint. To invite more people to the slide show, switch to Normal view, and then click the Send Invitations button. To end the broadcast, click the End Broadcast button on the Message bar or on the Broadcast tab. Click End Broadcast to confirm it.